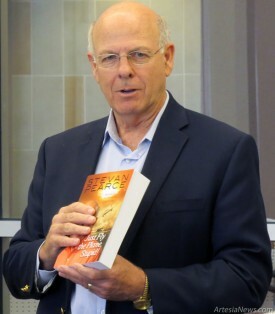 Congressman Steve Pearce visited Artesia last week for a Books N’ Bites event at the Artesia Public Library. Pearce read passages from and signed copies of his book, “Jut Fly the Plane, Stupid!” and spoke passionately about the struggles people face in life. The Friends of the Artesia Public Library hosted the event. … For the rest of the story, subscribe in print and on the web.